Home Attractions	ATTRACTIONS: Walks This Way. 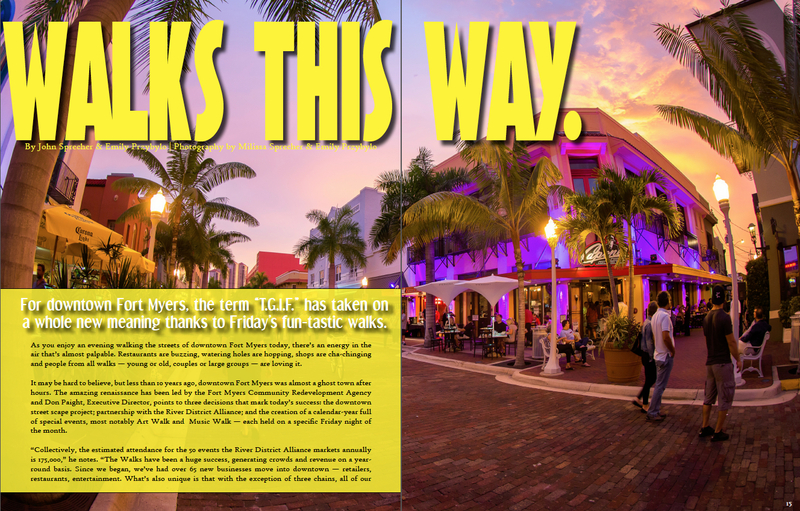 For downtown Fort Myers, the term “T.G.I.F.” has taken on a whole new meaning thanks to Friday’s fun-tastic walks. 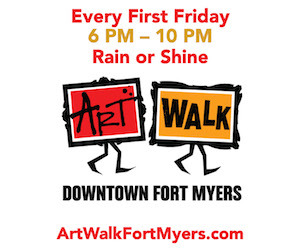 As you enjoy an evening walking the streets of downtown Fort Myers today, there’s an energy in the air that’s almost palpable. Restaurants are buzzing, watering holes are hopping, shops are cha-chinging and people from all walks — young or old, couples or large groups — are loving it. It may be hard to believe, but less than 10 years ago, downtown Fort Myers was almost a ghost town after hours. The amazing renaissance has been led by the Fort Myers Community Redevelopment Agency and Don Paight, Executive Director, points to three decisions that mark today’s success: the downtown street scape project; partnership with the River District Alliance; and the creation of a calendar-year full of special events, most notably Art Walk and Music Walk— each held on a specific Friday night of the month. 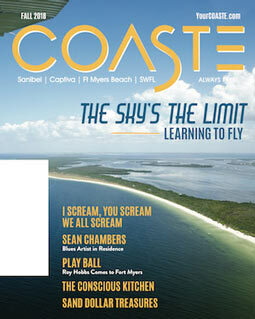 Click to view story online at COASTE digital magazine beginning page 14. So mark your calendar, ‘cause there’s a Friday night headed your way soon. She’s right; the galleries are packed and abuzz with conversations on vision, process and method, with artists eager to discuss their featured works on display. As you walk the streets and tour gallery after gallery, you’ll also encounter artists creating new pieces before your eyes, performance artists, plus original art for sale along the sidewalks. With all this walking, be sure to visit Patio De Leon, a charming, brick-lined historic walkway replete with your choice of food, drink, music, shopping — plus ready places to sit and take five, should your dogs be barking. ARTS: Meet the Art World’s Next International Rock Star.